This guest post is written by Jordan from the blog Natural Dog Owner. Read more about Jordan at the end of the post. The leaves are starting to change, which makes it the perfect time of year to go camping. Hiking with your dog and enjoying the foliage is a fun time for the two of you. However, you need to make sure that you’re both protected while you’re exploring the wilderness. Thankfully, there are many different options that you can choose to keep your dog tick-free whether you are on a camping trip or in your backyard. The best way to prevent fleas and ticks is through medication. There are oral medications, topical treatments, shampoos, and even flea collars. We have found success with the Seresto flea collar that also protects against ticks and has two active pesticides that are safe for your dog. If you are considering a flea collar, make sure that it doesn’t have any harmful chemicals for your pup. A flea collar is a great solution for someone that doesn’t want to administer medication, but a collar can be pulled off and generally only protects the face and neck of your dog. When placing a flea collar on your pup, make sure to monitor for any skin irritation for the first few days. You can buy oral medication at a pet supply store or from your veterinarian. We recommend doing research on pills if you are going to buy them yourself or asking your veterinarian what fleas and ticks are in your area. Some medication attacks immature fleas and ticks, others attack adult fleas and ticks, and there are those that repel fleas and ticks. Make sure to read the label closely in order to select the right product for you. Medications listed as “broad spectrum” are effective against many different species with just one dose. A topical treatment is one of the most popular ways to treat ticks, because they protect your pet for up to a month. You administer the medication by rubbing it on the back of your dog’s neck and that’s it! You can buy these medications at pet supply stores, online, or at your vet’s office. Always make sure to ask your vet about any treatment that you buy before administering it to your animal. My dog has ticks, now what? Even with medication, it’s possible for your dog to come back to your campsite with ticks. We recommend having a first aid kit handy that has materials to remove ticks. Your dog could potentially contract diseases from ticks like Lyme disease, Rocky Mountain spotted fever and Ehrlichiosis. So, you need to remove ticks from your dog as soon as possible. Make sure that you remove ticks within 24-36 hours of the initial bite. When your dog comes back to the campsite, make sure that you go over all of their body. If you see your dog biting at a certain area, they could be showing you that they have a tick. So, make sure you monitor your pet after each hike or trip in a wooded area. Ticks enjoy hanging out in warm places on your dog’s body. You should check eyelids, in between toes, the groin, around the tail, their ears, and near their bottom. If you find a tick, separate the hair and use tweezers to get as close to the head of the tick as possible. Then pull upwards away from the skin. After the tick is removed, clean the bite area with rubbing alcohol, soap, and water. You can also use iodine. Wash your hands once you are done. Kill the tick by flushing it down a toilet or drowning it in rubbing alcohol. If you’re concerned that your dog has contracted a disease you can save the tick for testing. Drop the tick in a sealed plastic bag and take it to your local vet. Don’t worry if the head of your tick stays in your dog’s skin, it will fall out in a few days. Ticks can easily crawl back to your campsite if you throw them off in the woods, so they need to be killed. And, if your dog has come back to the campsite with ticks, you could have them too. Check your body and your bedding to make sure that no ticks are hiding out in your gear. Jordan is the founder of Natural Dog Owner, a website dedicated to eliminating the headache that comes with developing a healthy and loving relationship between you and your dog. His main goal is to help give your four-legged family member the best quality of life imaginable. When he’s not in front of a computer he loves to spend time outdoors with his Goldendoodle, Carl, sharing stories and interacting with other dog lovers. We hate spam — so you can be sure we will never spam you! There's nothing better than a new adventure, but staying healthy and not gaining weight while you travel can be a challenge. Trust, me — I, and a huge pasta belly that I brought back from Italy (and thankfully lost), know. You're thrown out of your comfort zone, knocked out of your regular routine, and are no longer surrounded by familiar food, and your favorite workout spots. Whether you are planning on laying on a beach for a week or touring around Europe for months, these tips will ensure that the only extra weight you bring home with you will be from travel souvenirs. There's nothing better than celebrating a new adventure with a beer at the airport, a glass of wine on the plane, and then a nightcap when you arrive — and then continuing the celebration with a drink (or seven) every day after that. Don't worry, I am not telling you not to drink at all, but I am reminding you that alcohol is packed full of empty calories and sugar. Over-indulging will, more than likely, leave you bloated, craving sugar, and often lead to over-eating high-calorie foods. Of course, you are going to have a few drinks, but instead of reaching for a beer at the end of a long day of exploring, try a cold glass of water first. It will take the edge off your thirst (meaning that you might drink fewer high-calorie beverages), prevent bloating, and keep you hydrated. All important aspects of your overall health, and also important if you are recovering from jet lag. Cocktails may be delicious, but their high-sugar content can lead to weight gain. Opt for wine, liquor, or beer instead. Mixed drinks with sodas, juice, or energy drinks are terrible and will end in epic hangovers (cue high-calorie recovery eating the next day). Trying the local food is an important part of experiencing any culture, but you don't have to have huge meals out in restaurants for breakfast, lunch, and dinner — especially if this isn't the way that you would normally eat at home. Instead, eat out only one meal a day and eat the rest of your meals as you would at home — make them yourself or buy smaller portions from grab-and-go spots. Get a few dishes and share them with your travel buddies! That way you get to experience a variety of food without eating it all yourself. When you do eat out, instead of ordering appetizers, different courses, and dessert dishes all to yourself share your meals with your travel companion(s). Eating family-style will allow you to better control your portions and let you sample a variety of dishes without having to order them all individually yourself. Purchase things like fruit, nuts, and yogurt (if you have a fridge available), or pre-made meals, at the local grocery store or food market. These are the perfect things to eat for breakfast and lunches. Grab a piece of fruit from a local market to curb your hunger rather than sitting down for a full meal at a restaurant. Also, consider eating at local food stalls or trucks. The portion sizes will be smaller, the food will be fresh, and if you are on a budget, the meals at these stalls tend to be more affordable than what you would pay in a restaurant. If you are someone who gets hungry between meals or eats a specific diet at home, I highly recommend bringing your own snacks with you. Things like nuts, granola bars, dried fruit, etc. are things that can be packed easily, have high nutrition value, don't take up much space in your day-pack or purse, and can easily sustain you between meals. It will also prevent you from indulging in the high-sugar, high-calorie treats that are often sold at tourist sites. Are you visiting Rome for the first time? Skip the cab or metro and walk as much as you can. Spending a week at the beach? Go for a 20-minute swim every morning or rent a kayak and go for a paddle. Exploring New York? Rent a bike and peddle your way from attraction to attraction. Rent a kayak and go exploring while getting some exercise on your next trip. Try to avoid taking a bus, car, train, or metro and walk as much as possible. Walking is fantastic exercise, and you will be so distracted by all of the new sights, sounds, and smells of your foreign surroundings, that you will meet and surpass 10,000 steps before you even realize it's happening! How long is a workout really going to take out of your day? 30 minutes? An hour? If you are staying at a hotel with a gym, getting that 30-minute sweat in before you head out for the day, or before you go to sleep at night, could be the difference between gaining a few pounds and staying in shape. If you don't have access to a hotel gym, see if there are any local gyms near your AirBnB, hostel, or guesthouse that offers guest passes or short-term memberships. Or, plan ahead by bringing a skipping rope (Did you know that 10 minutes of skipping burns as much as a 30-minute run?! I take a skipping rope on every trip I take! ), bands, or familiarize yourself with some workouts that don't require equipment and can be done from anywhere. Take the opportunity of being away from your normal routine to try something different. In South Korea? Take a taekwondo class. Visiting India? Sign-up for yoga. Touring Spain? Find a Flamenco class. Or, go hiking, scuba diving, learn to sail — do anything that involves moving your body and taking advantage of the natural wonders that can be found where you are. Not only will you get a great workout, but you will also get to experience part of the country's culture that you are visiting and maybe even meet some locals! Don't over-indulge at every meal. Bring your own snacks and self-cater when you can. 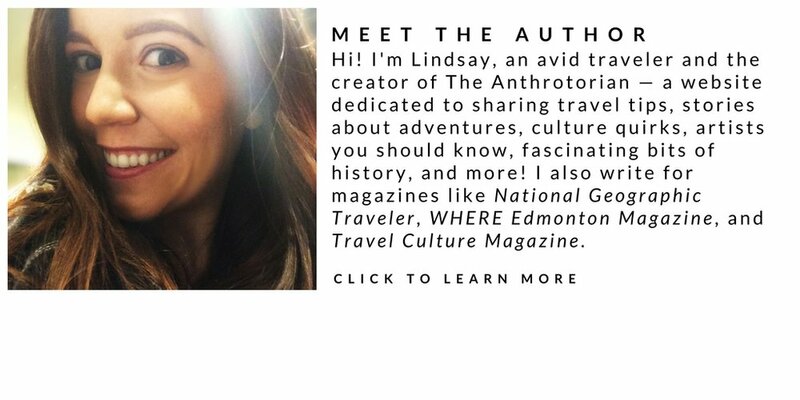 Get inspiration delivered straight to your inbox — subscribe to The Anthrotorian’s Newsletter!